Our kids have arrived on the boat. Everyone has been very excited. But, of course, child safety is paramount. Skipper Mark Burton has been very helpful in this regard. Mark is very comfortable with children. Professionally, Mark is lead skipper with the Ellen MacArthur Cancer Trust. The Ellen MacArthur Cancer Trust takes young people aged between 8-24 sailing to help them regain their confidence, on their way to recovery from cancer. Needless to say, Mark takes safety very seriously. But, as we enforce safety rules, such as not leaving the cockpit without a life jacket, our kids have found room to explore. With Mark’s support and encouragement Betty has discovered climbing the mast. This picture of Betty was taken around sunset, within an hour of arriving at our boat. Betty was so excited she had hoped to sail on our very first night. 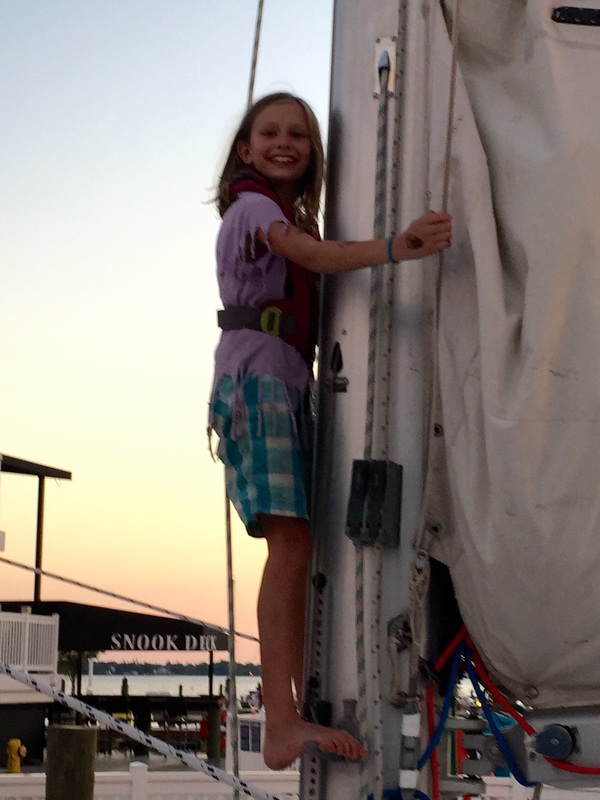 Betty (age 9) climbs the mast of SV Aphrodite. Paul (age 7) saw dolphins today. And, both Betty and Paul were eager to test out their auto-inflating life jackets by jumping from our boat into the water. Here is a short video of Paul. In the video he is testing his Spinlock Deckvest Cento Junior life jacket. Perhaps the most radical transformation can be seen with four-year old, Karen. Since arriving in Florida, Karen has gained tremendous confidence in the water. She has progressed from putting her face in the water to full-on diving with a life jacket. Here is a picture of Karen jumping off the back of our catamaran. 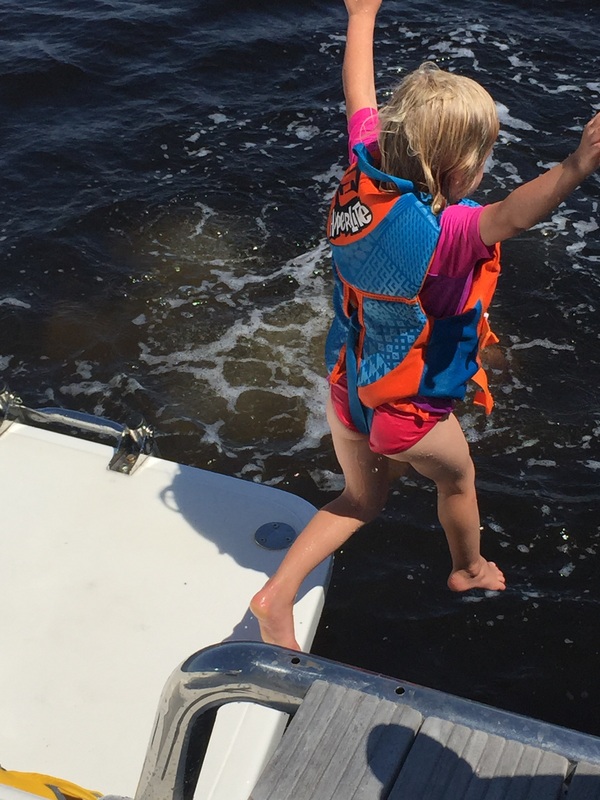 Karen (age 4), previously timid in the water, can now leap into the water from the back of our catamaran. Henry’s spunky personality and penchant for escaping the cockpit area and running about the boat is challenging. It’s been difficult because he thinks he’s being very clever. Today, he escaped from his climbing harness as were docking the boat. 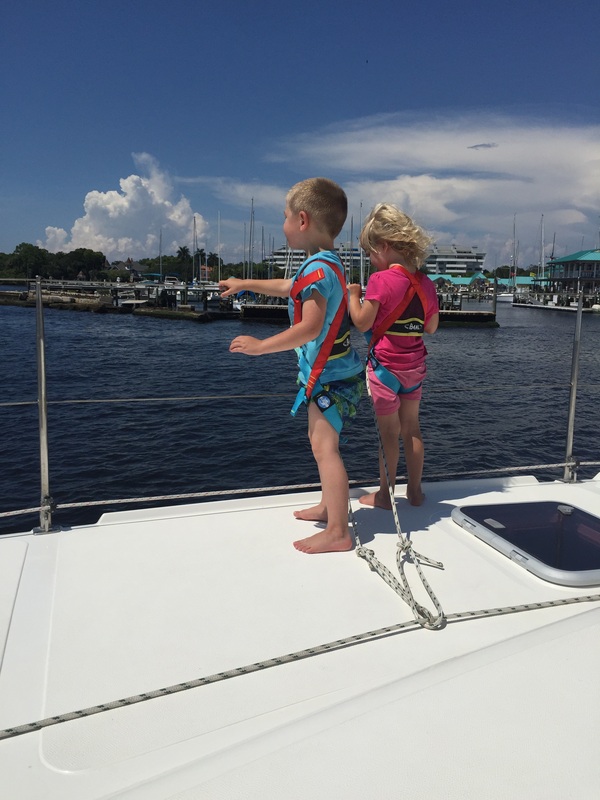 Here is a picture of Henry with his twin sister Karen in their climbing harnesses, tethered to a safety line on the boat. Henry and Karen (age 4) are tethered to a safety line. Our twins wear the Beal Bambi II climbing harnesses. Child management is a full-time occupation on SV Aphrodite. It’s new, it’s exciting. And, sometimes it’s painfully frustrating. I’m open to this experience aboard. But, it might be a while before I blog about single-handed sailing. Next Great Scots, 20 knots! Hi Betty and Lorraine, I just read out your entry to Evelyn who gasped at the sighting of dolphins. Evelyn says she wishes she was there to jump in the water with you. here are some of her personal favourite things to shout as she jumps into the water; I’m a carrot, I’m a bird, calabunga, Geronimo stilton. I don’t understand the carrot reference myself but since it gets her jumping into the water i’ll take it. we were recently camping at Charleston lake park so did A LOT of jumping and A LOT of shouting. thanks for sharing your experiences Lorraine.